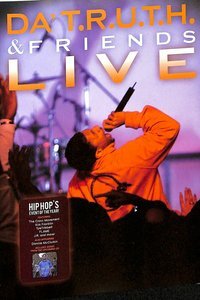 :Recorded live at the Impact 2006 Conference in Atlanta, GA, this unforgettable Hip Hop Worship experience features a host of Christian Hip Hop, Contemporary Gospel and Rhythm & Praise artists, including The Cross Movement, FLAME, Tye Tribbett, J.R. and others, invited to share in this unique celebration. Da' T.R.U.T.H. also gives a sneak peek into his upcoming album Open Book as he performs the blazing new single "Who Am I?" featuring Tye Tribbett and a surprise cameo appearance, as well as the soulful, Hip Hop hymn "Every Day" with raspy songbird, newcomer La'Tia Pittman. Enjoy the excitement of these performances along with many more surprises all captured in this one-of-a-kind DVD recording. About "Da Truth and Friends Live"
Philadelphia's Da' T.R.U.T.H. is a vanguard artist in the genre of Christian rap, having won numerous awards and critical praise. Originally a drummer, Emanuel Lee Lambert, Jr. became Da' T.R.U.T.H. in 2003 when the Cross Movement label released his debut EP Who Is the Truth. A year later, his debut album Moment of Truth appeared, with The Faith following in 2005. The latter won the Stellar Award of Rap/Hip-Hop Gospel CD of the Year in 2007. That same year his Open Book album arrived, winning its own Stellar Award plus a Grammy nomination, in 2008. His ambitious effort The Big Picture landed in 2009 with a guest appearance from Kirk Franklin.